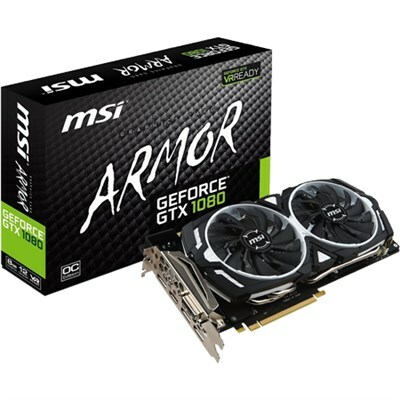 Hot Deals / MSI GeForce GTX 1080 8GB Armor - $500 at BuyDig.com! Questions or comments on TBG's Video Card Rankings (2017)? Post them here! Question or comments on TBG's article "Benching the GeForce GTX 1080 Ti: Air vs. Liquid Cooling"? Post them here! Comments or questions on TBG's $1,000 Ultra-Slim Gaming/NAS/HTPC ITX PC Build? Post them here! Comments or questions on TBG's $1,750 Content Creation PC Build? Post them here! Comments or questions about TBG's article "AMD Giveth and AMD Taketh Away"? Post them here! Comments or questions about TBG's $1,300 Stock Trading PC Build? Post them here! Good news, folks. The Tech Buyer's Guru has just rolled out a few major website updates for 2017. The most pertinent to members of TBG Forum is that the entire domain has been upgraded with an SSL certificate to encrypt data, ensuring that your data is secure. We take privacy and security seriously, and want you to feel safe using the site. One quick note - this did cost quite a bit of money to implement, and requires the purchase of an annual SSL certificate, so remember, running a forum isn't free. Please help support our efforts by using the affiliate links we share throughout the forum when you're looking to purchase new products. To help you help us, we've upgraded all Amazon.com links - Canadian and UK readers are now directed to their regional storefronts rather than the US storefront. Other enhancements you'll find on the main website are embedded YouTube videos as in our recent SilverStone PM01-RGB review, and new buyer's guide headings that clearly identify optional and task-specific products and components, as in our Laptop Buyer's Guide. Amazon's holding its "Summer Black Friday" July 11, and while the very best discounts are to be found on Amazon-branded products, there a few others worth going for. Remember, you have to be an Amazon Prime member to get these! (1) Amazon Echo ($90, regularly $180) - this is by far the best deal going for Prime Day. We've tested every Smart Home speaker out there, and this is easily the best - far better than the Google Home that goes for $130, or the Amazon Tap that also goes for $130. And at this price, it's simply a must-have. (2) The Echo Dot ($35, down from the regular price of $50) - this is a very good entry-level Smart Home device. We have a bunch, and recommend them to all our friends and family members. While not a great music player due to the low-fidelity speaker, it's a perfect low-cost personal assistant, and can pair with Bluetooth speakers to take the music quality up a few notches. (3) Amazon Element 55" 4K HDTV ($400, regularly $650) - seriously, if you don't have a 4K TV yet, do yourself a favor and pick up this awesome deal! (1) Acer Predator Helios Laptop ($900, regularly $1,100) - If you're looking for a portable gaming system at a great price, this is it. Equipped with a blazing-fast Core i7-7700HQ quad-core CPU and a GeForce GTX 1060 6GB video card, this is the real deal. And because it has 16GB of RAM and a 256GB solid-state drive, it will be ultra-responsive all the time, not just in games. (2) Asus G20 Gaming Desktop ($1749, regularly $2000) - whoa, are you serious! This thing is amazingly powerful, offering a Core i7-6700 processor, a GeForce GTX 1080 8GB video card, 16GB of RAM, a huge 512GB SSD, plus a 1TB hard drive. And it's just awesomely compact! (3) Asus Zenbook ($630, regularly $700) - the Zenbook is already the obvious choice among thin-and-lights, which is why it's a mainstay in our Laptop Buyer's Guide, and at the sale price, it's a fantastic bargain. (1) Symphonized Headphones ($15, regularly $25) - these are in our Speaker/Headset Buyer's Guide for a reason: they sound great! Honestly, at $25, they were already a good deal, and at $15, they are a serious steal - no wonder they've almost entirely sold out before we even get to the official July 11th Prime Day! (2) HyperX Cloud Revolver Headset ($90, regularly $120) - this is a high-end headset at a mid-range price, at least for today. We've never this product drop below its MSRP, so $30 off is a serious discount. (3) HyperX Alloy FPS MX Blue Mechanical Keyboard ($70, regularly $100) - if you've always wanted to try a serious gaming keyboard but haven't been willing to pay top dollar, grab this Cherry MX-equipped board at a big discount! (4) Corsair Glaive Gaming Mouse ($55, regularly $70) - just in case you thought Prime Day was all about clearing out old stock, here's proof that it's not: Corsair's brand-new high-end gaming mouse is on sale for the first time ever! (5) Corsair Hydro H100i v2 Liquid Cooler ($85, regularly $110) - this is the one we use in our high-end eight-core PC Build! (6) TP-Link Archer AC1900 Wireless Router ($80, regularly $110) - we've tested this one, and it can keep up with routers costing $150 or more! (1) Schlage Connect Deadbolt ($143, regularly $179) - this is by far the best Smart Home deadbolt on the market. Yes, we know the August Lock is on sale too. Don't bother - it doesn't even come close to the Schlage in terms of functionality. (2) Kalamera Wine Cooler ($384, regularly $600) - we have a larger model, and it's not just an appliance - it looks great too! (3) Fisher-Price PowerWheels Dune Racer ($200, regularly $290) - kids + powerwheelsl = tons of fun! Video Cards / TBG Commentary: The Great Ethereum Scam? If you have questions or comments regarding TBG's Commentary article "The Great Ethereum Scam? ", post them here! Comments or questions on TBG's review of Cyberlink PowerDirector 15 Ultra? Post them here! We're starting a new thread for TBG's $3,500 Ultimate Gaming PC Buyer's Guide given the major CPU and GPU updates to this build. To see discussion about the previous $3,500 Build, see this thread. Starting a new thread for the $2,500 build, as it has changed significantly since the last thread was created. Feel free to post any and all questions here! TBG is pleased to announce that it has started up a unique partnership with SilverStone Technology Co., which has signed on as a sponsor of TBG's Do-it-Yourself PC Buyer's Guides! SilverStone has made its entire product catalog available to TBG, so you'll be seeing many of SilverStone's newest cases, power supplies, and PC accessories featured in the guides, often long before you see them featured anywhere else. To enter to win, simply post a message in this thread with your prize preference. The two winners will be chosen on June 20th (the first day of Summer!). Due to shipping costs, the contest is open only to readers in the 48 contiguous United States - sorry to all our Canadian, Australian, and European readers, as well as everyone else around the world!